If you are reading this and are unsure about the safety of vaccines, the first thing I need to tell you is that absolutely, unequivocally, without the slightest shadow of a doubt - vaccines are safe. So the question is why exactly are the likes of Robert De Niro and Robert F. Kennedy issuing a challenge about vaccine safety? Are they genuinely concerned with the safety of vaccines? I suppose it is possible that they are, but the reality is that there is absolutely no reason to be worried. Vaccines have been shown for a long time to be safe. Well as safe as any medicine can be anyway. There are always some risks involved when taking medicines. It's why every medicine you ever take has a warning label. Because there is a risk - a risk that is considered to be acceptable. The reason we know that there is a risk is because there is a rigorous system of regulation in place that ensures that medicines and vaccines are tested. We know exactly what percentage of the population we would expect to have an adverse reaction to any treatment and these risks are always weighed up against the benefit of any treatment. In the most extreme cases it is certainly possible for a person to have a severe allergic reaction to a vaccine, but it is very rare. Not that the anti-science crowd would have you believe this. No, they would happily tell you that vaccines cause every condition under the sun including vaccine injury and autism. (In reality vaccines cause neither). 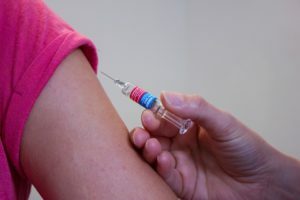 If you are feeling overwhelmed when it comes to which information you should be listening to when it comes to vaccines, then I suggest you check out my post on fake news. The one thing that I cannot stress enough is that vaccines work. You can pick any disease which is now vaccinated for and look at the infection rates or the death rates for those diseases, comparing the rates before vaccination and after vaccination to see how much impact vaccines have. In fact, in the UK, the only deaths from vaccine preventable diseases in recent years have been in members of the population who are not vaccinated. And even those who are not vaccinated still benefit from herd immunity, which quite literally is a life saver for people who are immunocompromised and medically unable to receive vaccine as their weakened immune systems cannot cope with them. So lets - just for one second - do the unthinkable and agree with De Niro and Kennedy for a second. Just a second mind you! And accept that vaccines can cause harm or even autism. 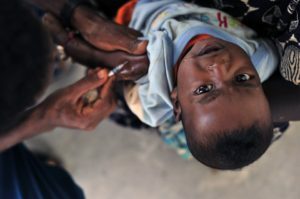 (Don't worry; they still don't) Over the last fifty or so years, uncountable millions of people have been vaccinated and the numbers of people who have (according to the anti-vaccine crowd) been harmed by vaccines is astonishingly small. Yet the numbers of lives saved is staggeringly high. And the number of people prevented from living a life of suffering thanks to avoiding a vaccine preventable disease is also staggeringly small. So the real question is not "are vaccines safe?" but more pertinently, "Which vaccine preventable disease are you willing to risk your child suffering?" Because even if there is a slight risk of vaccines doing harm, we know the effects of these diseases. They are incredibly harmful; they often lead to life long issues or even death. The benefits of vaccination far outweigh any associated risks. Of course, I should probably re-iterate, the risks of vaccination are incredibly small and there is literally no link between autism and vaccination. None. So why does this myth persist? Well in 1998, Andrew Wakefield (I will refrain from calling him a doctor. As he has been removed from the medical register, he is no longer allowed to practice medicine.) published a paper linking autism and vaccination. Like any good scare story, it helped to shift news papers. As a direct result, vaccination rates dropped over concerns that the MMR vaccine might be harmful. Mixed messages from the government at the time didn't help either. Tony Blair, the British Prime minister at the time, spoke out in support of the MMR vaccine in public, but in private it was unclear if his infant son received the vaccination. This did nothing to quash the story about MMR being harmful. A link between MMR and autism was now in the public psyche. Only in the west do we have a fear of vaccines. In countries where there is a real risk of disease, people have no concerns about their safety. This, of course, had the medical community in a quandary. Was MMR really dangerous? Much research was done, some of which helped to expose Wakefield as a fraud. The evidence was in and it was conclusive. MMR was safe. Do you think the media had much interest in correcting all of the fear mongering that they had so gleefully championed abut MMR just a few years prior? Of course not. So the myth prevails still. With scare stories still swirling around about vaccines the anti-vaccine crowd simply could not accept the simple truth that vaccines are safe. So they followed through with conspiracy theory 101. They moved the goal posts. No longer only satisfied with the idea that "vaccines cause autism," they moved their wrath to a specific ingredient in vaccines. Thimerosal. Why did they target thimerosal? Well, it was an easy target, because thimerosal is a compound that contains mercury, and as we all know, mercury is an incredibly toxic substance. Not something we want to consume in our bodies. For those who have a basic level of scientific knowledge, it seems pretty cut and dry. Mercury is dangerous - therefore vaccines must be dangerous. But this is a flawed argument. Compounds can contain toxic elements, yet be completely safe. Take table salt for example. It contains chlorine, a chemical weapon used during the first world war. It also contains sodium, a metal so reactive it burns and explodes when placed in water. Not the kind of things you want to be eating? But as sodium chloride, table salt, they are completely harmless. Thimerosal - at least in the dosages found in vaccines - is also totally safe and was an essential ingredient in vaccines working as a preservative. Needless to say, the attack on vaccines had changed again once there was proof that thimerosal was not the cause of autism. The goal posts moved once more. The new threat was formaldehyde. Just like thimerosal, used as a preservative. Just like thimerosal, an easy target as it is a compound that the public have heard of and generally know that it has the potential to be harmful. It certainly is a prime candidate for a good bit of scaremongering. But a little bit of reading up on the topic reveals something interesting. Eating a pear provides you with a higher dosage of formaldehyde than receiving a vaccine. So why are they not up in arms about pears? The real truth here is that there is a small but vocal proportion of the population who will never be convinced about the safety of vaccines. Who will always ignore the literature available and cherry pick a discredited study as their evidence. They are blinded to the the consensus as their agenda drives them on always looking for a new angle to prove themselves correct. They won't manage it, but that won't stop them from trying. Which is why the $100,000 challenge is such a joke. It would make no difference what evidence you presented to them! It would make no difference how well conducted a study was. It would be dismissed out of hand because it doesn't fit with their pre-conceived notions. They will never pay the money to anyone, but show them a poor study or bit of anecdotal evidence that supports their claim and they will champion it as if it was the greatest bit of research ever conducted. So, have I actually tried to prove that vaccines are safe? No. It's an impossible task. But I do hope I have presented a little bit of evidence that vaccines are not dangerous, and that the benefits of vaccines are immeasurable. If you want to understand more about the science of vaccinations or why certain elements may be harmful on their own but when found in compounds are completely safe, then Make Science Easy can help you out. If you sign up for more information here then we will send you lots of FREE interesting science news as well as great offers and discounts for our online science courses.